About a year ago, I read a few books of the German doctor Max Otto Bruker. This was after I realized that my consumption of refined sugars (especially in the evenings... in the form of chocolates etc) made me feel wobbly, lethargic and tired the next day. Apart from that, it messed with my appetite: I would only have appetite for breakfast at lunchtime, another snack in the afternoon, some dinner and then again still be sort of hungry later in the evening and stuff myself with sweet stuff. It was a vicious cycle. Bruker (1909-2001) recommends a diet high in whole foods. Nothing new, but I needed this eye-opener. He considers most of today's civilization diseases (like diabetes and arthritis) as diet-related illnesses, caused by malnutrition from vitamin-deprived and sugar-loaded or white flour based foods, too much meat and other animal proteins. He looked at the whole foods diet as the original diet that was created for man. This includes whole grain cereals (preferably freshly ground), fruits, vegetables, salad and unprocessed nuts and seeds. One third of a daily diet should be raw since these foods contain more vitamins, minerals and trace elements than the processed counterparts. Refined sugar and flours should be totally avoided. Since I read those books, I managed to cut out most of refined sugars and flours from my diet and moved towards natural foods, fresh or as little processed as possible. I still like my chocolates though, but I have cut them down by quite a bit (on most days......). Changing my breakfast routines was one of the easiest parts. This recipe is loosely based on Bruker's recommendation of eating lots of raw foods. The millet, oat and spelt flakes (being bought in the shops as they are) have surely been treated somehow to make them last longer. But it will still be better than some white bread (refined flour) with margarine (hydrogenated fats) and jam (refined sugar). And with regards to the FIVE A DAY portions of fruit or vegetables: this breakfast has at least two!!! Put millet, oat flakes and spelt flakes in a bowl and add the water so that they are just covered. Soak the grains for at least half an hour (better one hour), to soften them. All water should be absorbed. The millet/quinoa takes longest to soften. If you don't have the time, leave them and use more flakes instead. Chop the banana and the peach. Drain any excess water from the grains. 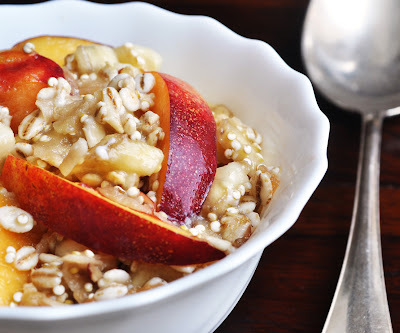 Combine grains and chopped fruit in a breakfast bowl. Add grated apples on top. Garnish with yogurt or cream and sprinkle with sesame seeds.